Romania or Rumania has existed from about 200 B.C., and was known to the Romans as Dacia. Romania has maintained a strong identity throughout history, which is too complex to give here in full. After 1947, it was under Russian Soviet rule as a socialist republic. In 1989, a anti-communist revolution, started in Timisoara, which overthrew Nicolai Ceaucescu, and formed an independent republic. 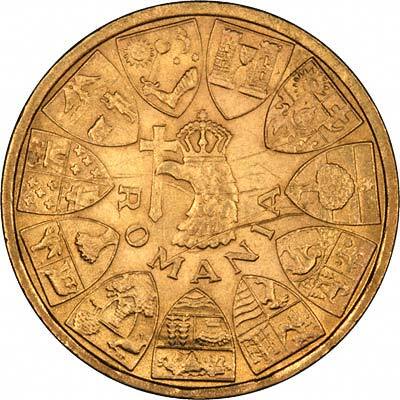 Romanian gold coins are denominated in lei, which is the plural of leu. 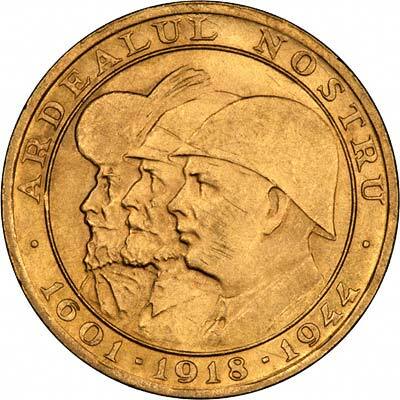 We give below the specifications of most of the more frequently encountered Romanian gold coins, followed by a stock list of any we have for sale. Crowned eagle's head holding a cross with the word ROMANIA below, surrounded by 11 shields, each bearing a different coat-of-arms. For silver and base metal coins of Romania, please look at our original Chard Coins website.